jacksonovrsazivlm - Join our team of Downtown Guides! 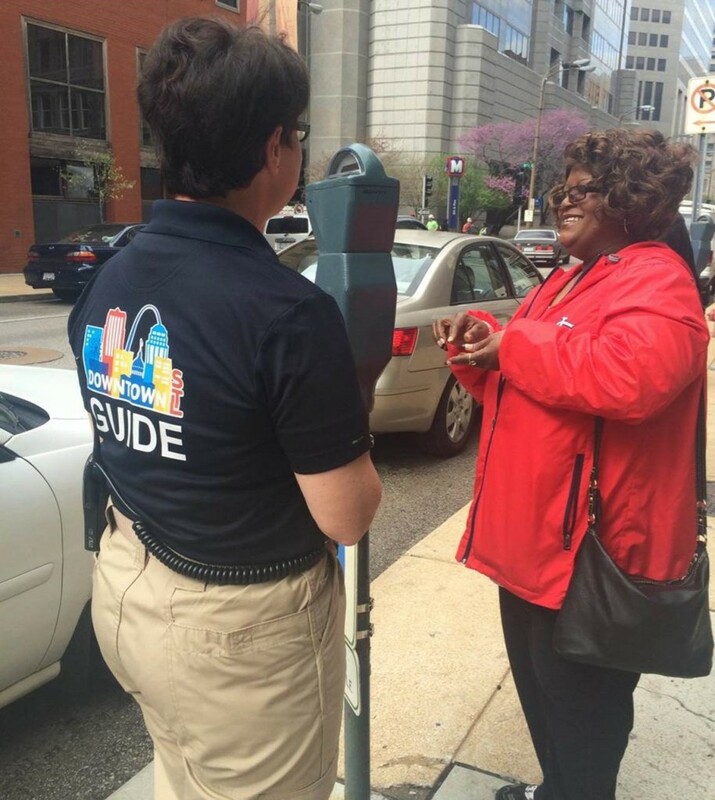 The Downtown St. Louis Community Improvement District (CID) Guides are a group of friendly ambassadors that work to make Downtown feel safe, fun and inviting. The Downtown Guides enhance the perception of safety, by providing hospitality services and additional security within the CID, the team also works with the St. Louis Metropolitan Police Department to observe and report crime or suspicious activity in the Downtown area. We are looking for full-time members to join our team! To apply, submit an electronic version of your resume to rengelke@downtownstl.org or mail it to 720 Olive St, Suite 130, St Louis MO, 63101. Work in a community and team oriented atmosphere.Work with a diverse group of people.Create a friendly, outgoing, safe, helpful and approachable presence in the CID.Advise conventioneers, visitors, workers and residents about the amenities of Downtown, such as attractions, retail & restaurant venues and parking choices.Keep a watchful eye out for graffiti, litter and report areas of concern.Observe and report any suspicious activity in the proper manner.Distribute Downtown information literature as appropriate.Interact with Downtown business owners and record of their comments and/or concerns.Be available to answer questions, assist visitors, etc.Provide after-hours security escorts of conventioneers, visitors, workers and residents as needed. Be trained in the duties, functions and responsibilities of the job.Work on shifts that may rotate and consist of non-standard hours and weekends.Be deployed to and remain in a specific assignment area on foot and/or bicycle.Be in compliance with rules, regulations and standards established by supervisory personnel of Downtown STL, Inc.Comply with all rules, regulations, policy, procedures and ordinances of the City of St. Louis and the St. Louis Metropolitan Police Department.Complete special assignments as designated by supervisory personnel of Downtown STL, Inc.Respond to calls for service as directed by the dispatcher or a supervisor.Prepare a variety of reports and records in a clear and concise manner.Perform the duties of the job outside in various weather conditions, which can include wind, rain, snow, humid conditions and varying intensities of heat and cold. Be 18 years of age or older at the time of employment.Be a United States citizen.Be able to read and write the English language.Not have a disqualifying criminal record of conviction.Be of good moral character and temperate with industrious habits.Possess a high school diploma or G.E.D. from an accredited institution.Require skills to operate a bicycle.Have the ability to learn and follow policies, rules, regulation and standard operating procedures.Successfully pass a drug screening test.Be able to communicate orally and in writing.Be able to establish and maintain effective working relationships with subordinates, peers and supervisors.Follow verbal and written instructions.Exercise sound judgment while taking an appropriate course of action.Be able to stand and/or walk for long periods of time without relief.